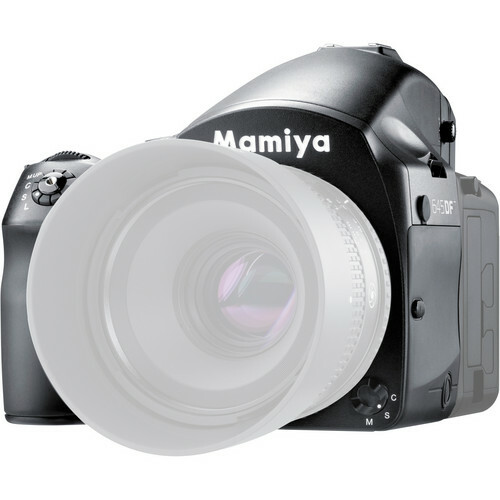 The Mamiya 645DF+ Medium Format DSLR Camera Body is an open platform, digital medium format camera that that can use a digital back with an image area much larger than standard 35mm, leading to increased image quality. The camera is compatible with multiple brands of digital backs, including Leaf, Hasselblad, and Phase One, due to its open platform design. It also works with Mamiya focal plane lenses, Schneider-Kreuznach leaf shutter lenses, Mamiya 645 AFD lenses, and Hasselblad V lenses. While using leaf shutter lenses it is possible to reach a flash sync speed of 1/1600 second, and with the focal plane shutter it will sync at 1/125 second. Additionally, the camera features 1st and 2nd curtain synchronization along with an X-sync terminal and support for TTL flash metering. The 645DF+ features improved autofocusing system with phase-difference detection and 3 focus points. An infrared AF-assist beam will ensure accuracy even in poor lighting conditions. It also features a custom adjustment feature that allows you to fine-tune the alignment of the body to the back to match your focusing needs. Customization is emphasized in this model. It features an interchangeable focusing screen and allows for 3 custom dial modes for preferred capture settings. It also features 36 custom settings and programmable dials and buttons. Box Dimensions (LxWxH) 11.6 x 8.3 x 7.9"
Where is the official 220/120 film back for this camera? Unfortunately, film backs are not compatible with this camera.